Charge Faster: Qualcomm Quick Charge 3.0 technolog，up to 4 times faster than conventional chargers. Intelligent Identification IC: Detect your device and deliver the optimal current to connected devices intelligently. Compatibility: Compatible with all USB powered devices including Quick Charge 2.0 & Apple,Android phones & tablets. 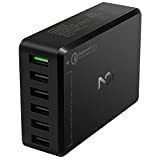 Multi-Port Charging: 1 Quick Charge 3.0 port and 5 universal USB charging ports enable you to charge up to 6 USB-powered devices simultaneously at fast speed. Quick Charger 3.0 ,Safe use more than 18Months , High Quality Smart Charger. Specifications: Product feature: MCU control charge system, with single port& total current protection function. Typical output A: 5V7.2A (1-5USB port /each port 2.4A max) . Typical output B: 5V3A / 9V2A / 12V1.5A (QC3.0). Inrush current: 30A max@240V AC. No load power consumption:0.075W max. Whether it’s your first N01 purchase or you’re back for more, rest assured that we’re in this together: All N01 products are backed by our 18 Month Product Warranty.